Alert: This recipe contains units of measure, it cannot be imported into Desktop Insight as is. You must recalcuate it to percentages and then to the total you need (if it has not be done here). This body is not available for sale. Yet. I am beta-testing it. I have done a long series of test mixes in search of a blend of North American materials that will produce a fritted white low-fire oxidation porcelain. But I was not able to do so. The difficulty is that the glassy phase of the frit amplifies the color of any iron available in the body (even tiny amounts) to produce a bone or ivory white. The only solution was a switch to New Zealand Kaolin (which contains only 0.15% iron) and VeeGum. The result is dramatically better. However a pinkish color still remained. This made it necessary to add a small amount of blue stain. Now it has the color of cone 10 reduction porcelain! Be careful about substituting that stain. We have found this one flows freely. If the stain you substitute agglomerates during mixing you will get ugly blue specks in your porcelain! This body pairs with G2931K clear glaze (the fully fritted version of G2931F) and a drop-and-soak firing glaze schedule. Look for a links to that here or google it. -The 30% frit: Frit is expensive (no normal porcelains contain it because of this). But it makes the impossible possible! -The NZ Kaolin: The whitest available in the world. -The VeeGum: Super plastic super-white. Bentone also works. -The silica for glaze fit and as a structural framework. As noted, this body will be among the most plastic you have even used (of any kind). But this is only true if it is stiff enough. If you try to use it soft the shrinkage will be much higher and you risk drying cracks. One caveat: This is not an attempt to rival the fired surface of cone 6 Plainsman Polar Ice, it is not as smooth and dense (but it is almost zero porosity). You could, of course, fire higher to produce higher density. But remember, this is frit-ware, warping issues will creep in quickly as temperature is increased. Firing higher than cone 03 will not necessarily produce more strength either. It will produce more fired shrinkage (which is already quite high). -Fast firing: two or three times a day (as little as 3 hours start to kiln opening). -The appearance of cone 10R but with far brighter colors. -High strength (rivaling any other temperature). -Throw ware ultra thin and light. -A perfectly fitted ultra-clear glaze that is far cheaper to make than commercial glazes (and works better). -Dramatic reduction in wear-and-tear on kiln elements and energy usage. -Remember to factor in the fact that you will be able to charge more for pieces when you calculate clay-cost-per-piece. A final note: Because this body matures at such a low temperature it needs to be bisqued much lower. You will need to experiment. Consider starting at around 1500F. If ware is not absorbent enough fire lower. Units-of-measure: I have specified 50 lb bags to fill the needed amount for the NZ kaolin, however it comes in 20kg bags. But you are likely mixing in grams or ounces so just refer to the percentage column. One more thing. Consider getting an account at insight-live.com, copy and paste the recipes and document all your testing well. And you will get monthly email updates on this another projects. This is an all-fritted version of G2931F Zero3 transparent glaze. I formulated this glaze by calculating what mix of frits must be employed to supply the same chemistry of the G2931F recipe. 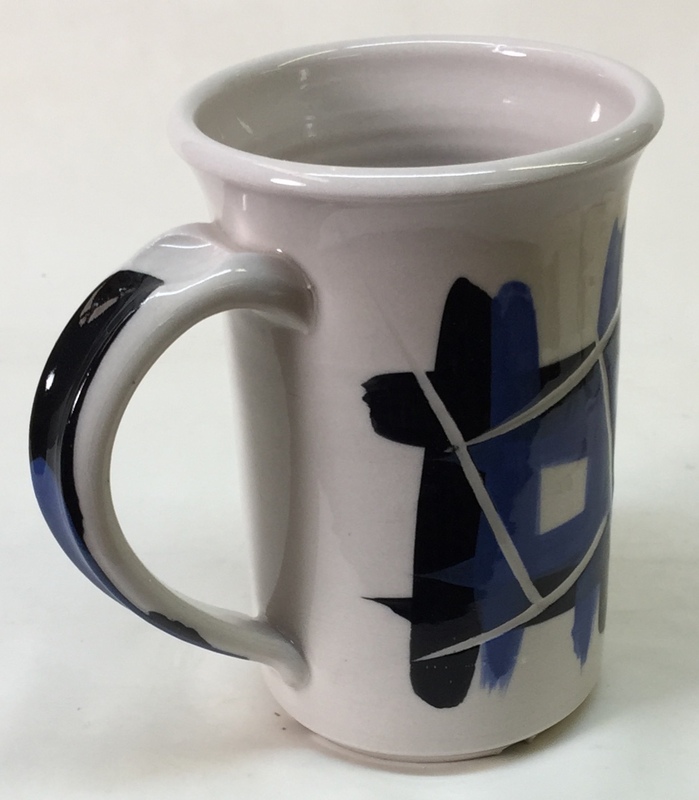 The mug is made from the Zero3 porcelain body (fired at cone 03) with this glaze. This glaze fits both the porcelain and the Zero3 terra cotta stoneware. The clarity, gloss, fit and durability of this glaze are outstanding. Can a cone 03 porcelain be better than a cone 10R one? Yes! Want to make this incredible porcelain and glaze yourself? Read on. 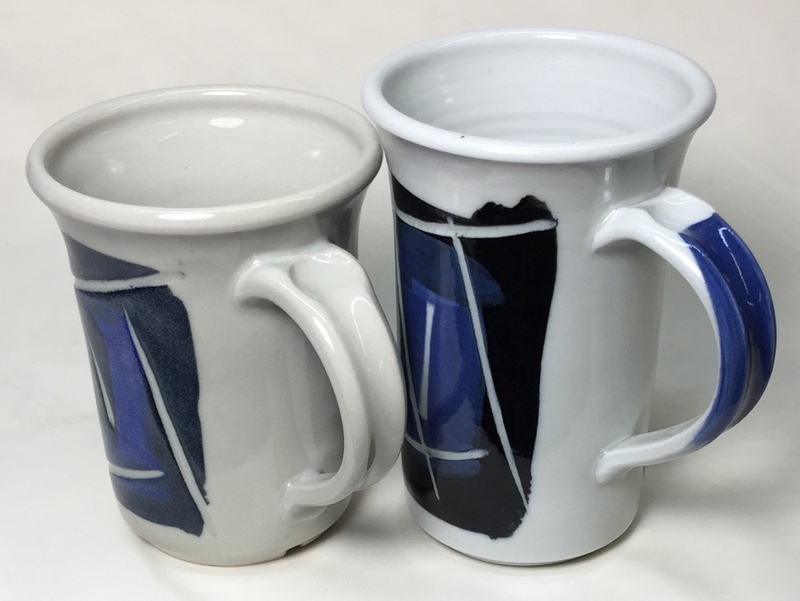 The mug on the left is a cone 10R (2350F/1290C) porcelain (#6 Tile kaolin and Nepheline Syenite) with G1947U clear glaze. The other is a fritted cone 03 (1950F or 1065C) porcelain (NZ Kaolin, Ferro Frit 3110) with G2931K clear glaze. We call the body/glaze/firing system "Zero3" (google it or use the links here). 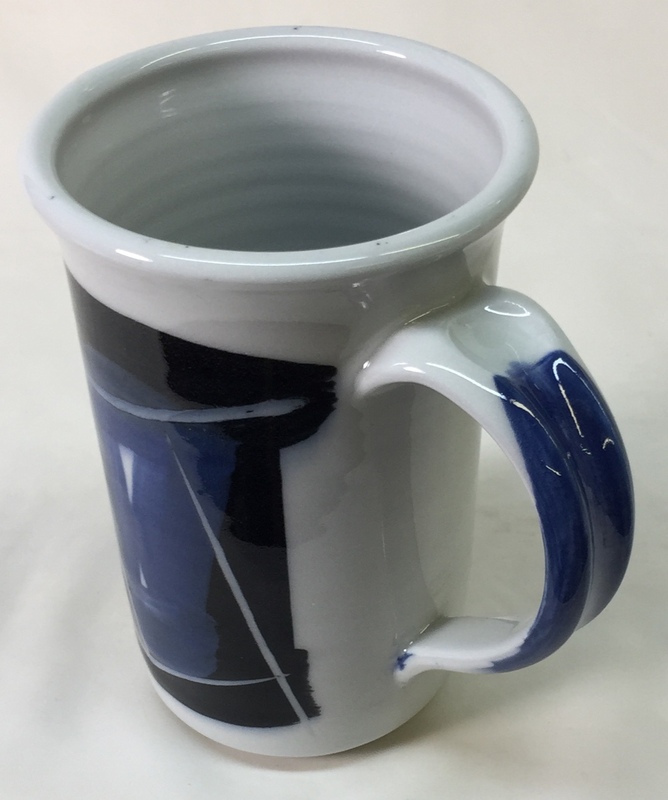 The Zero3 porcelain is blue-white instead of grey, the glaze is crystal clear, underglaze colors are so much more vibrant. The Zero3 mug was fired in 3 hours (cold-to-cold). It also withstands thermal shock better, it is as strong or stronger and much more translucent. How is this possible? The magic of the frit, it melts so much better than nepheline. The recipes and method are linked here. It is the most expensive body you will ever make. But from it you will create the highest quality ware you have ever made using the most plastic body you have ever thrown! Follow the instructions carefully. Porcelain mug put into kiln at 8:45am, drinking coffee from it at 12:15! How? One way to fast-fire is to fire a lot lower. This is Zero3 porcelain made using Dragonite Halloysite (instead of New Zealand Halloysite). It is the L2934C recipe. It was fired to cone 03 and glazed with G2931K clear glaze (which has fired crystal clear and flawless). I fired at 1200F/hr to 1950F, held it for 15 minutes, cooled at 999F/hr to 1850F and held it for 30 minutes, then dropped as fast as the kiln would do. It has some translucency and fires with a purplish hue (the NZ burns blue-white and is more translucent). 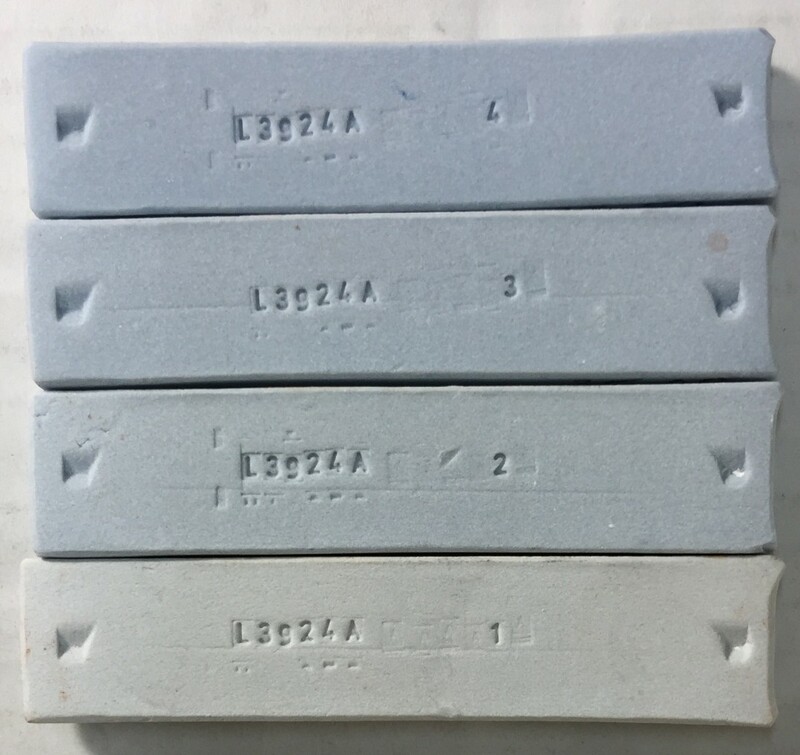 These fritted porcelain bars are fired at cone 06, 04, 03 and 02 oxidation (bottom to top). The body contains 0.2% blue stain. Notice that almost no color develops at the lowest temperature. Glass development is needed. I propeller-mixed a 5 gallon pail of the slurry yesterday. Overnight it forms a gel in the pail. That means that whenever I need some I can simply scoop it out and lay it on the batt in a thick layer. This is about 6 kg, it will take about two days to dewater enough (undisturbed) for use. A cone 04-02 clear glaze developed from Worthington Clear. This employs Ulexite instead of Gerstley Borate and has a lower thermal expansion. A cone 04-02 clear glaze developed from Zero3 which in turn was developed from Worthington Clear. This employs frit instead of Ulexite.